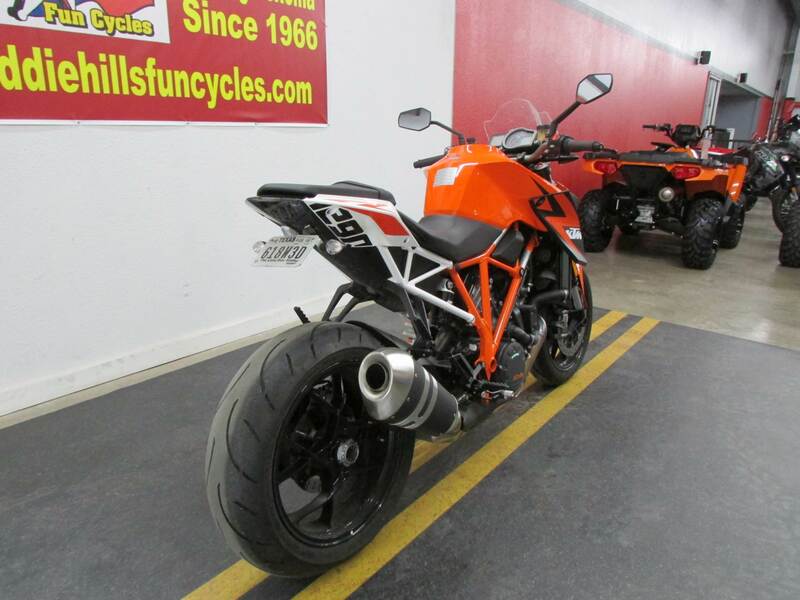 In the form of the KTM 1290 SUPER DUKE R, KTM has crowned its legendary Naked Bike model range with a machine that redefines the term 'Streetfighter'. 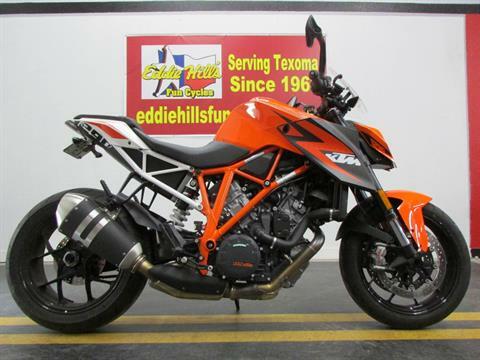 One look at its impressive performance data and aggressive design is enough to see that the 1290 R is the most extreme Super Duke ever. Thanks to unbeatable performance in conjunction with the versatility provided by the adjustable riding modes and PowerParts setups. Pure riding pleasure is pre-programmed - from the racetrack to the city and everywhere in between. The new KTM 1290 SUPER DUKE R perfectly embodies the KTM philosophy: endless power, highest precision, perfect ergonomics, finest ingredients, not a gram too much, simply "Ready to Race"! 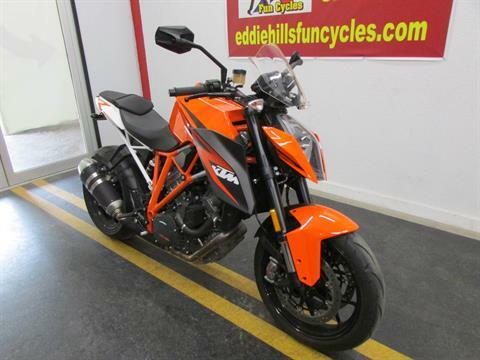 The KTM 1290 SUPER DUKE R – high-tech in an aggressive design with unprecedented functionality and razor-sharp sportiness reduced to the essentials. 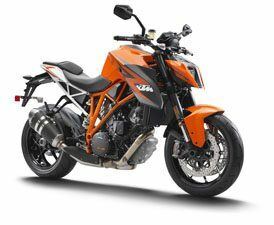 The new KTM 1290 SUPER DUKE R transforms optimum performance with maximum safety into ultimate riding pleasure. DASHBOARD: The KTM 1290 Super Duke R supplies its rider with all necessary and desirable information on a state-of-the-art, clearly arranged instrument cluster from VDO. 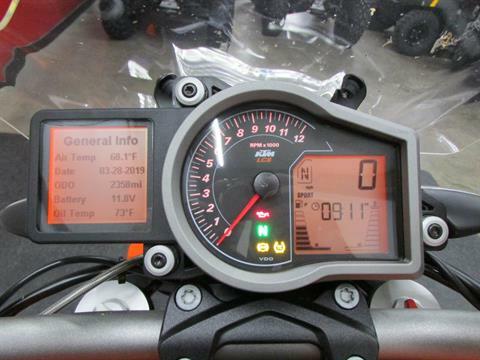 Core data is displayed on a central instrument that consists of an analogue rev counter with integrated, adjustable gearshift light and an LCD display. This display is dominated by a digital speedometer and supplemented with a digital clock, a gear indicator, bar graphs for coolant temperature and fuel level plus the display for the selected ride mode. A second LCD display is positioned to the left of the central instrument, which serves the purpose of conveying important additional information and displaying numerous menu pages as a screen for the on-board computer. Everything is tidy, clean, clear, intuitive and simple to operate – while riding as well. MODE SWITCH: The on-board computer's menu pages are selected and operated using the four control keys of the mode switch on the left handlebar grip. It's very simple and intuitive: "up" and "down" through the menu selection, select the desired menu item with the left button, confirm it with the right, job done! The Exit key on the left of the mode switch can be pressed at any time to return to the previous menu level. A user can learn menu navigation in no time at all. ERGONOMICS: Have you ever thought about seat position? 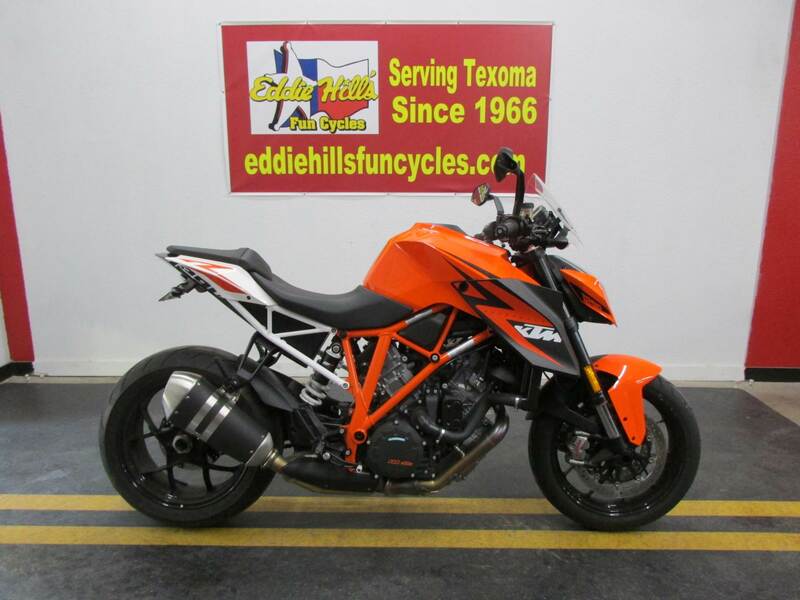 Stack and reach, leg arch length, seat height, seat foam, knee angle and knee contact, handlebar width, position and offset, the shore hardness of grip rubbers, tall riders, short riders, fat or skinny – simply everything is as it should be on the new 1290 Super Duke R. Simply get on and feel comfortable. Everyone. Male or female. USER VALUE: Surprises are best when nobody expects them. 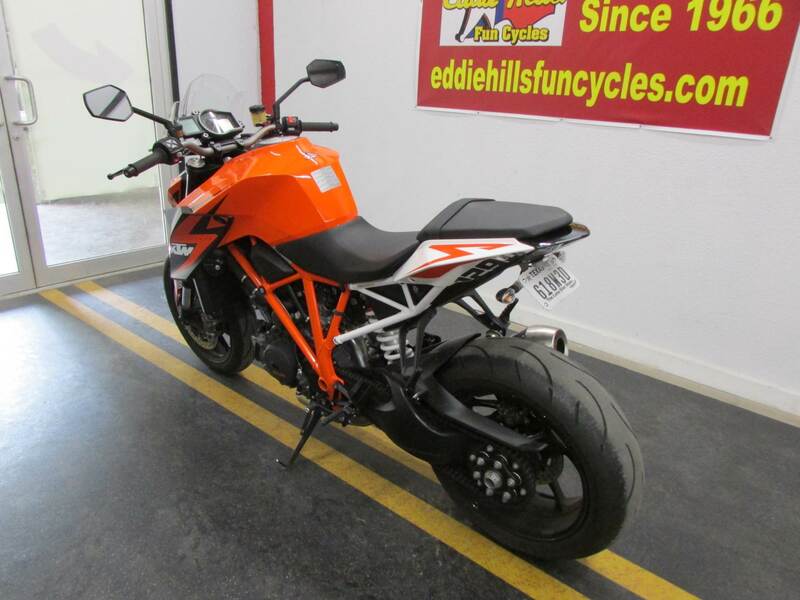 For example, the KTM 1290 Super Duke R is very economical with fuel. And it only needs to be serviced every 15,000 km. And it comes with a daytime running light as standard, amazing wind protection plus sufficient comfort for longer trips. RIDER ASSISTANCE: The unique combination of a sensational engine with a perfectly balanced chassis supplies the rider with unlimited riding pleasure and a high level of safety in all conditions on the KTM 1290 Super Duke R. The prerequisites for absolute predictability and highest safety levels are provided not at least by the KTM 1290 Super Duke R's leading-edge assistance systems: ride-mode technology, ride-by-wire, lean-sensitive traction control (MTC) and Bosch 9M+ two-channel ABS. RIDE-MODE-TECHNOLOGY: Ride-mode technology provides the rider with a choice of three ride modes on the KTM 1290 Super Duke R, which can be selected quickly and simply with the mode switch on the handlebar. In conjunction with the ride-by-wire system, the selected ride mode influences the general responsiveness of the engine, its maximum peak power and traction control (MTC) intervention. "Street" and "Sport" modes deliver a full 173 hp and appropriately potent power development with a sporty traction setting. By contrast, "Rain" mode limits maximum output to 100 hp with smoother performance and traction characteristics. RIDE-BY-WIRE: Instead of the electronic injection system's throttle valves being controlled by cables, ride-by-wire processes throttle twist grip movements with the help of electronic sensors and activates the throttle valves accordingly using servo motors. 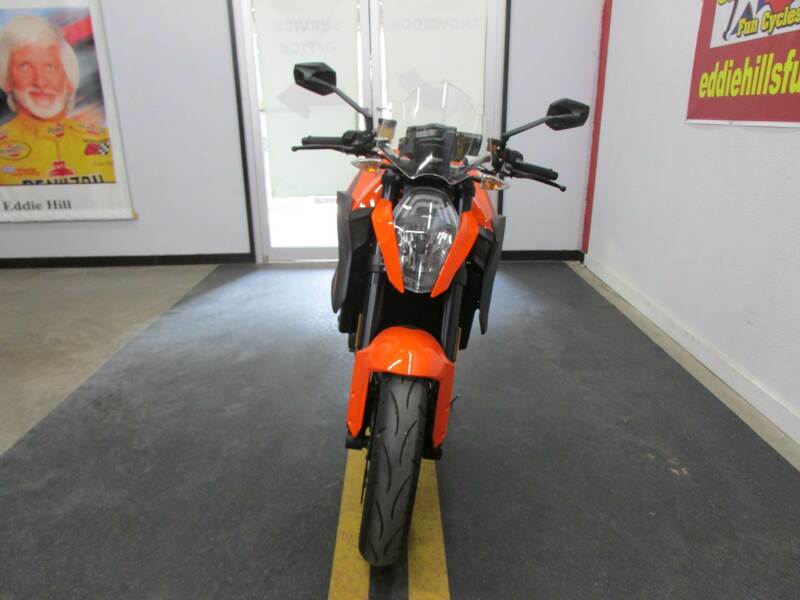 However, the ride-by-wire system on the KTM 1290 Super Duke R achieves even more: It electronically translates the throttle commands of the rider into optimum throttle valve positions for the current riding situation. Choking, jolting and involuntary wheelies are a thing of the past. FRONT BRAKE: More than adequate deceleration is ensured at the front wheel on the KTM 1290 SUPER DUKE R by a Brembo twin-disc brake with two floating, 320 mm, perforated brake discs, two radially mounted, M50 four-pistons monobloc fixed callipers and a radial hand pump. The spacing between hand brake lever and handlebar is adjustable so that the lever is within easy reach for every rider. 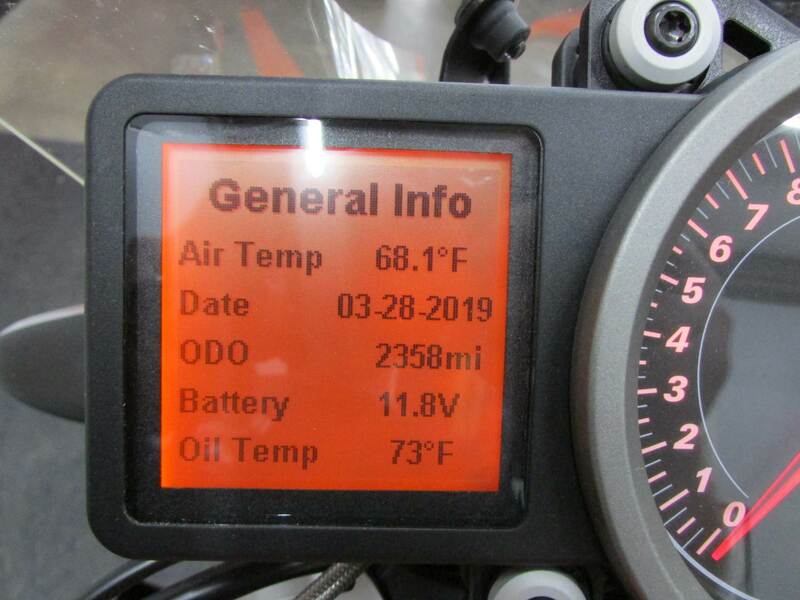 TRACTION CONTROL (MTC): The MTC (Motorcycle Traction Control) lean-sensitive traction control system reacts immediately, if the rotational speed of the rear wheel is disproportionate to the riding situation. In a matter of milliseconds, MTC reduces the engine output with an extremely smooth, barely perceptible intervention at the throttle valves, until the system has reduced slippage to optimum proportions for the selected ride mode and current angle of lean. Depending on the selected ride mode, MTC traction control allows different levels of traction slip at the rear wheel. In "Street" mode somewhat more than in "Rain" mode, while slight power slides are allowed when exiting curves in "Sport" mode. All this means that the rider can concentrate on the run of the road and other road users – the guarantee for maximum performance and ultimate riding pleasure, but also a decisive contribution to active safety. For particularly ambitious riders, who feel like enjoying the breathtaking propulsion of the KTM 1290 SUPER DUKE R without any electronic assistance, the traction control can also be switched off. ANTI-LOCK BRAKING SYSTEM (ABS): Like no other ABS, the Bosch 9M+ two-channel, anti-lock braking system on the KTM 1290 SUPER DUKE R, stands for extremely short braking distances with optimum vehicle control. The system modulates brake pressure in such a way that locking of the wheels is prevented perfectly and the endo tendency is minimised when braking hard on surfaces with good grip. Depending on the selected ride mode (Sport, Street, Rain), the traction control system intervenes sportily/delayed to safely/undelayed. For racetrack use, ABS can be deactivated at both, the front and rear wheel. In "Supermoto" mode, only the rear wheel is freed from ABS intervention. REAR BRAKE: The front brake receives effective support from the disc brake on the rear wheel, which features a two-piston fixed calliper. The enormous potential of the Brembo brakes can be exploited to the full on the KTM 1290 SUPER DUKE R thanks to its sportily tuned anti-lock braking system. STEERING DAMPER: With its extraordinary stability and razor-sharp precision, the KTM 1290 SUPER DUKE R doesn't really need a steering damper. However, on a motorcycle with 173 hp, the front wheel does become light when riding hard and then any pothole or little bump in the road can cause handlebar kick-back. The KTM 1290 SUPER DUKE R is therefore equipped for safety reasons with an equally reliable and sensitive, hydraulic steering damper from WP Suspension. CHASSIS: Mechanics can be so beautiful – above all, when designers can draw on unlimited resources. 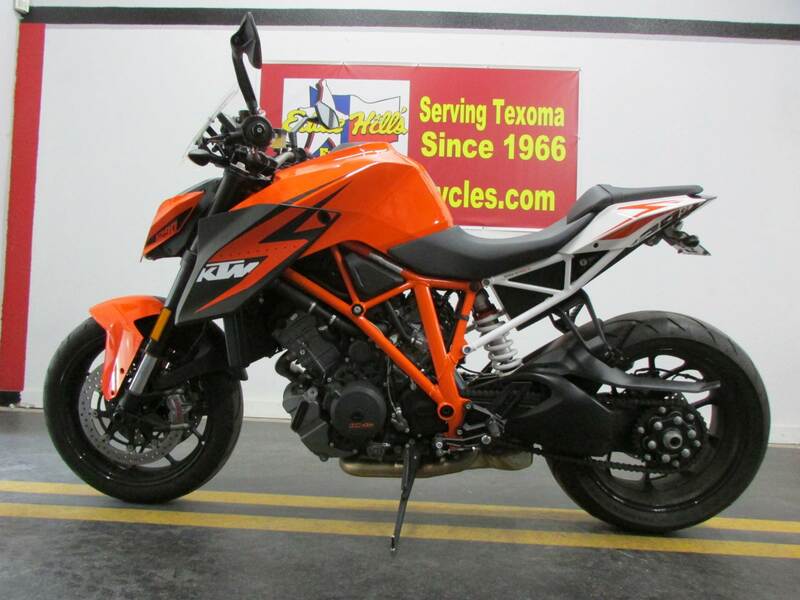 Whether it is the tubular trellis frame, the single-sided swingarm, the fork or the shock absorber, the KTM 1290 SUPER DUKE R consists of only the finest components. Perfectly arranged and tuned with one another, for only so are such excellent steering precision or such gigantic reserves created. SINGLE-SIDED SWINGARM: The jaw-droppingly beautiful, light alloy, single-sided swingarm on the KTM 1290 SUPER DUKE R is not only the lightest in its class, but also particularly and precisely manufactured and generously dimensioned – a potent partner when the Super Duke R unleashes its torque and riding dynamics. The rear wheel is fitted to an axle 50 mm in diameter and bolted in place with a 60 mm central wheel nut. The design of the swingarm is adapted optimally to the tubular trellis frame in terms of flexural behavior and stiffness. A high-precision, eccentric adjustment is used for tensioning the chain. SHOCK ABSORBER: The directly articulated, high-quality WP pressurised-gas central rear shock with external remote reservoir offers numerous setting options over a wide set-up range. Compression and rebound damping can be regulated independently – with separate settings for high-speed and low-speed compression damping. In addition, the spring preload can be adjusted by hand. TELESCOPIC FORK: Thanks to multiple setting options for spring preload and damping, the extremely stable and torsion-resistant upside-down telescopic fork from WP Suspension on the KTM 1290 SUPER DUKE R also enables optimum adjustment of the chassis in order to suit the respective operational use and preferences of the rider. Not only can rebound and compression damping be set separately, but also completely independently from each other thanks to the 'split principle' (the left fork tube controls compression and the right one rebound damping). This allows riders to find their desired set-up quicker and more precisely. 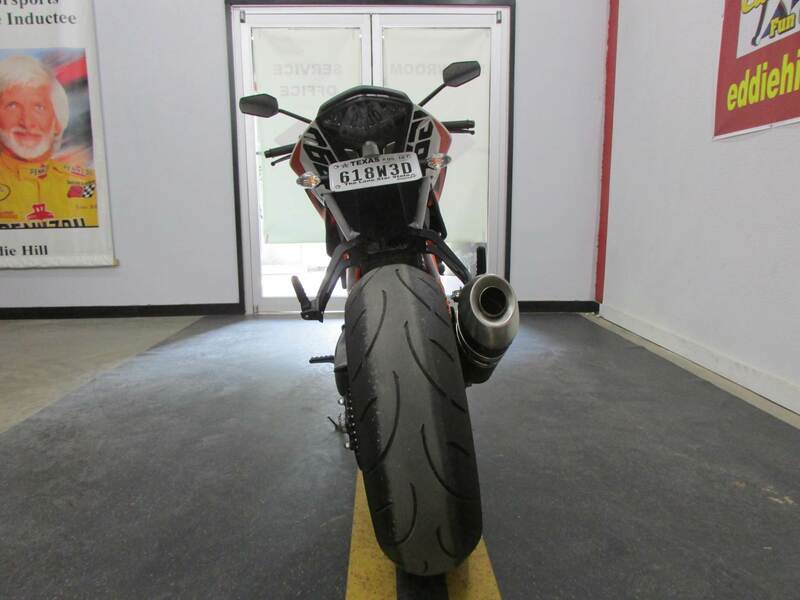 WHEELS AND TYRES: With seamlessly wound tread strips, the tailor-made Dunlop Sportsmart² tyres on the KTM 1290 SUPER DUKE R enter new technological territory. Even for wear, perfect steering behavior, grip in every situation and fantastic ride stability. Perfect tyres for perfect riding pleasure. The tubeless sports tyres are fitted on extremely lightweight, light-alloy wheels manufactured in a low-pressure die casting process. Not only do the lightweight wheels make the bike lighter overall, they also minimise the unsprung masses and moment of inertia, with a positive impact on the handling and ride dynamics of the KTM 1290 SUPER DUKE R.
ENGINE: The engine of the KTM 1290 SUPER DUKE R originates from one of the most powerful and refined V2 power units of our times, from the engine of the KTM 1190 RC8 R superbike. KTM engineers increased the displacement of the LC8 powerplant, not simply by boring it out, but by well-balanced enlargement of both, bore and stroke. Weighing in at around 62 kg, the extremely slim four-valve unit is one of the lightest big twins in the world, yet it still develops no less than 173 hp peak power and 144 Nm maximum torque. CYLINDER HEADS: A major contribution is made to the outstanding performance of the LC8 engine on the KTM 1290 SUPER DUKE R by its state-of-the-art DOHC four-valve cylinder heads with twin plug ignition. The twin ignition system controls the ignition sparks of both, spark plugs in each cylinder head independently of each other using separate characteristic maps, thereby ensuring both more efficient combustion and a smoother combustion sequence. The result is more power, more torque, smoother running, even better controllability, higher fuel economy and lower emissions. Two overhead camshafts in each cylinder head use DLC-coated cam followers to operate four valves that control the charge cycle via flow-optimized ducts. 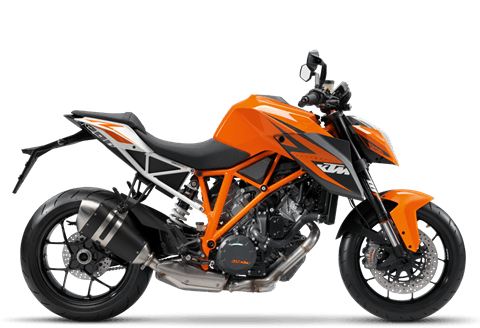 PISTONS: The forged piston structure on the KTM 1290 SUPER DUKE R, borrowed from Formula 1 technology, results in a high loading capacity, despite the extremely short and lightweight design. Although they have grown in diameter by three millimetres compared with those of the 1190 RC8 R, the pistons on the Super Duke R are a whole 47 grams lighter. In this way, reciprocating weight is minimised, thereby maximising the responsiveness and free-revving nature of the engine. Furthermore, the piston skirts have a state-of-the-art, hard-anodized finish. Not only does this minimise friction, it is also particularly hard-wearing with a consequently positive impact on durability. SLIPPER CLUTCH: The slipper clutch on the KTM 1290 SUPER DUKE R automatically takes the pressure from the clutch plates when engine back-torque becomes too high. This effectively prevents rear wheel chatter when braking sharply. In addition, the clutch increases pressure on the clutch plates with increasing engine torque, thereby allowing softer clutch springs to be used. This reduces the hand strength required for hydraulic actuation of the clutch – now it can be controlled with just one finger. ENGINE MANAGEMENT: The electronic Keihin engine management system with twin throttle valves regulates the modern electronic fuel injection system, focussing on maximum power with predictable engine characteristics and spontaneous responsiveness with controllable throttle response. The throttle body has been enlarged from 52 to 56 mm in the area of the throttle valves for the KTM 1290 SUPER DUKE R in order to optimise power development. 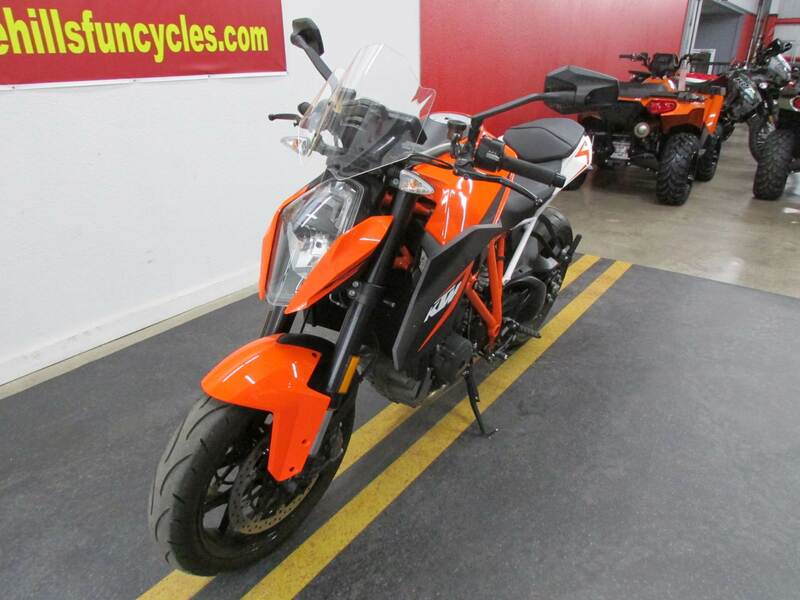 CRANKSHAFT: The responsiveness and free-revving nature of the KTM 1290 SUPER DUKE R's engine are also enhanced by the very low reciprocating weight of its crankshaft. Moreover, the flow-optimized shape of the crank webs boosts the particularly low-loss running of the crank drive, with casing evacuation improved by the use of a third oil pump. 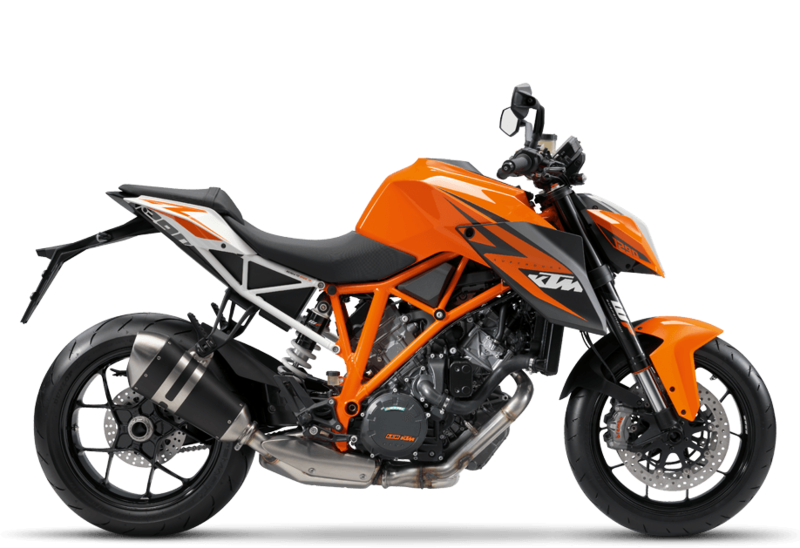 EXHAUST SYSTEM: The KTM 1290 SUPER DUKE R's completely newly designed exhaust system is made entirely from rustproof stainless steel. Hundreds of test bench runs and complex simulations ensured that the exhaust system, which accommodates the regulated catalytic converter in the presilencer, contributes decisively to the extremely smooth torque curve and excellent emission values of the powerful twin-cylinder. Chain - X Ring 5/8 x 5/16 in.